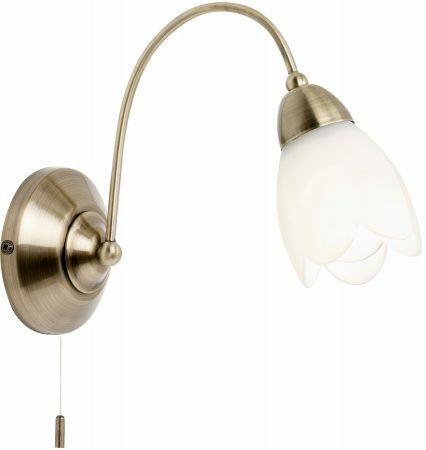 The Petal traditional 1 lamp antique brass finish switched wall light is traditional, features a matt opal glass petal shade and is fitted with a convenient pull cord switch. Circular antique brass finish wall mount and over-arching curved arm, with downward facing matt opal glass petal shade for a softer light. A lovely compact wall light fitting, with a convenient pull switch that is well suited to any traditional setting. There are matching light fittings in the antique brass finish Petal lighting range, please see below.